Bright lights and gaudy signs have been synonymous with Vegas for decades. But where do all the old signs go when they retire? The Neon Museum is located a little way away from the Strip, with its visitor centre located in the historic La Concha Motel lobby. 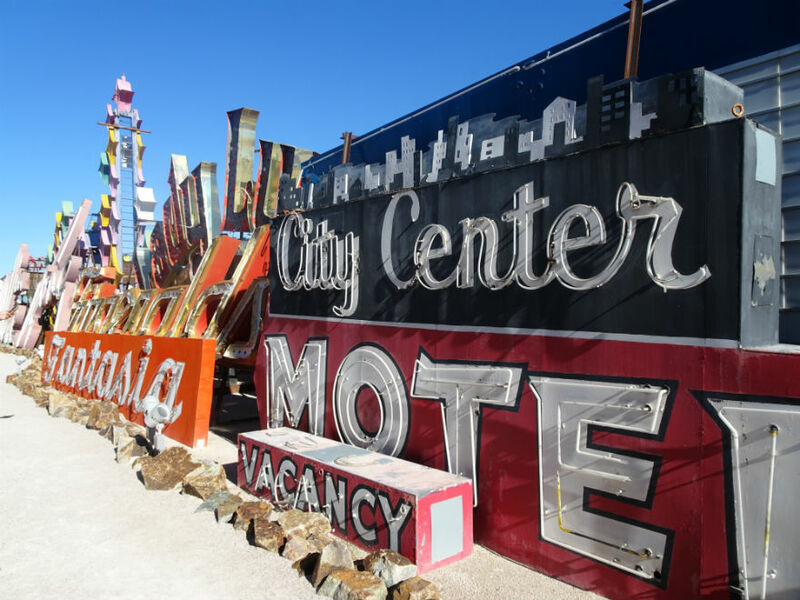 The Neon Museum is just like a sign graveyard – but rather than being a place for the signs to rot away, never to be seen again, the team offer hourly guided tours throughout the day. It’s a great place to start your Las Vegas visit, because it gives you an insight into the city’s quite recent history. Also nearby is the Mob Museumwhich is regularly praised as one of the best museums in America. Unfortunately we didn’t get time to visit, but it’s definitely on the list for next time! 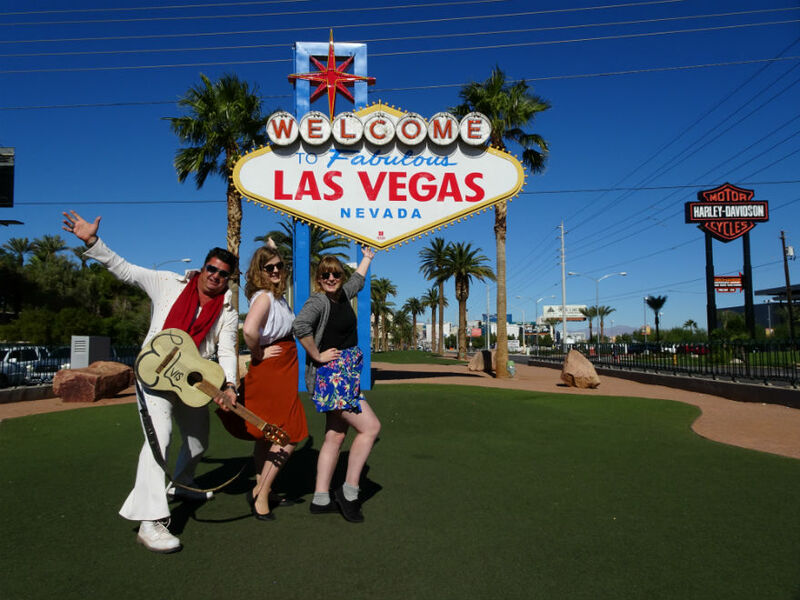 Pro tip: at the Neon Museum all the signs are located outside, so bring sunglasses, water and a hat etc with you! Not just yet another hotel, the 1,149-foot Stratosphere doubles up as an observation tower, offering views all across the desert and over the strip. Right up the top there are a couple of actual rides that like to hurtle you out over the edge of the tower as if you’re about to fall right down to earth. We gave those a miss, opting instead to have some lunch in the cafe and admire all those views. 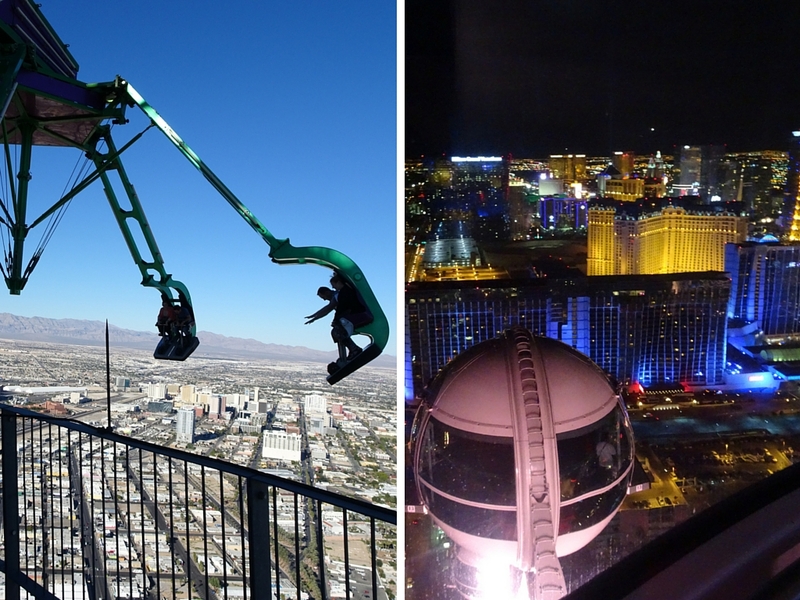 The Linq High Roller is the place to go for something a little special. It’s just like the London Eye, but with views out over the extravagant hotels, hotel pools, airport… And it’s even a good place to start the night, with it being possible to reserve a space in a pod with its own bar! 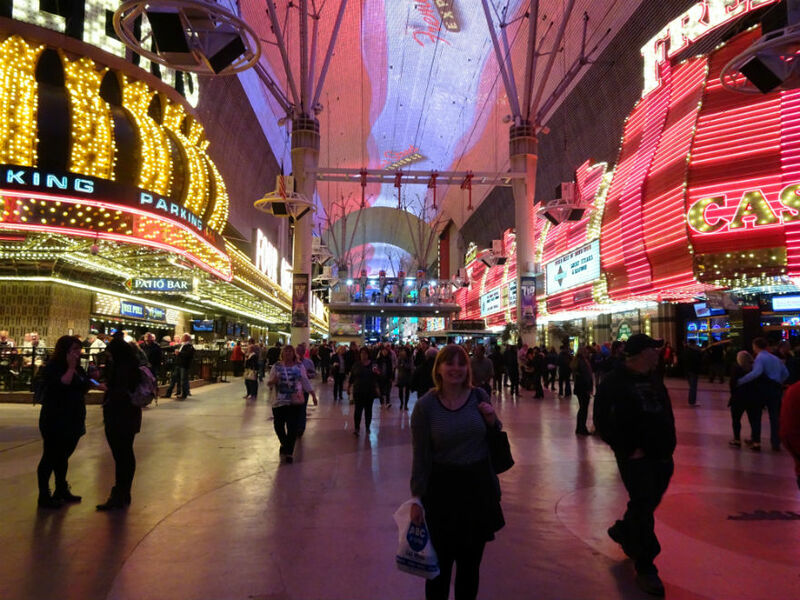 Zip-lining, restaurants, casinos – there’s no end of things to do at Fremont Street in Downtown Las Vegas! It’s not somewhere that many people think of heading to (we even got congratulated by one cab driver for going there…), but it’s worth the trip. There’s a massive LED canopy under which zip-liners zoom past, street entertainment and vintage neon signs. It’s crazy. 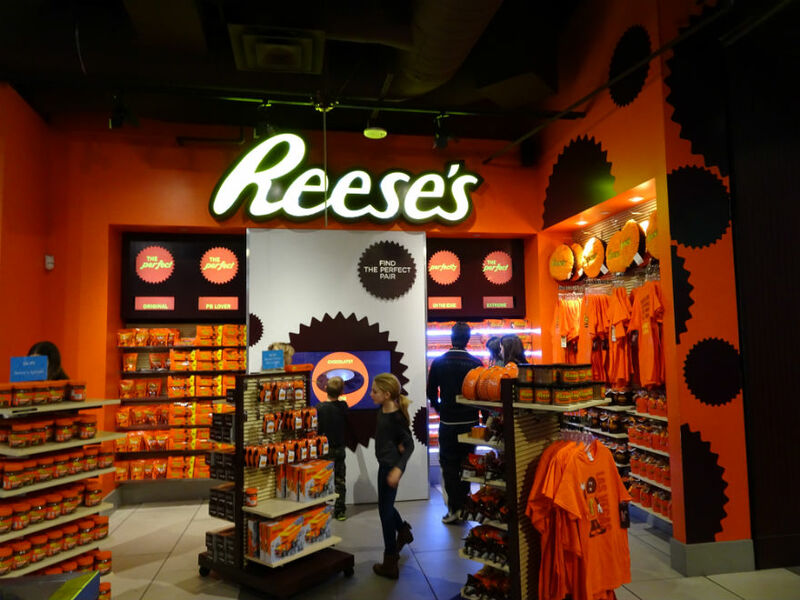 But it was also one of my favourite stops in Vegas! Because it’s amazing. That is why. Yes, it’s a little bit annoying that it’s broken up into four separate chunks, but it comes in handy if you’re wanting to travel between MGM station and SLS Las Vegas. And it’s just fun to ride. Yet another pro tip: the monorail stations are often hidden at the back of hotels, so you’ll often find it’s easier and quicker to just take a bus up the Strip if you’re in a rush. You can’t come to Las Vegas and not see the iconic sign! It’s situated to the south of the city, around a 10-minute walk from Mandalay Bay resort (although you can also just get a bus down there). It’s best to turn up super early to avoid the queues, but if you can’t don’t worry. When we went there was a long but orderly queue, with an official photographer and Elvis impersonator on-hand to spice up your photos. And the best thing about it? It’s completely free! You would seriously need a good decade or so in order to explore every single inch of the hotels. They’re not kidding when they say they’re ENORMOUS! 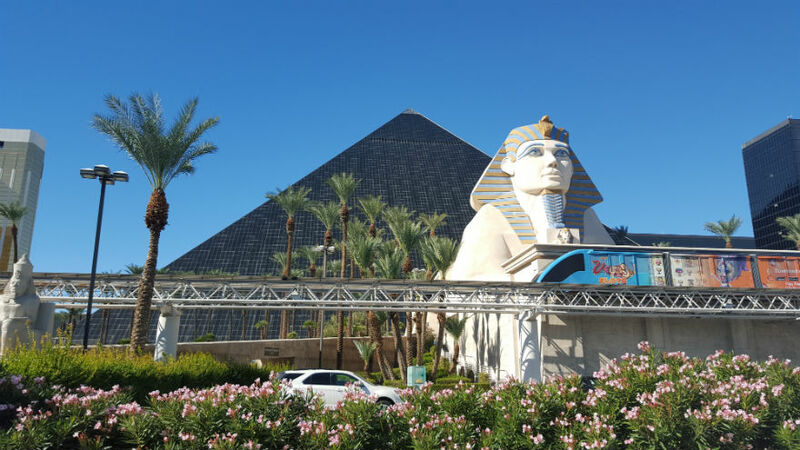 The hotels aren’t just a place to lay your head; there’s everything from casinos to nightclubs, restaurants, shops, exhibitions, museums, arenas…you name it, it’s probably in one of the Vegas hotels! 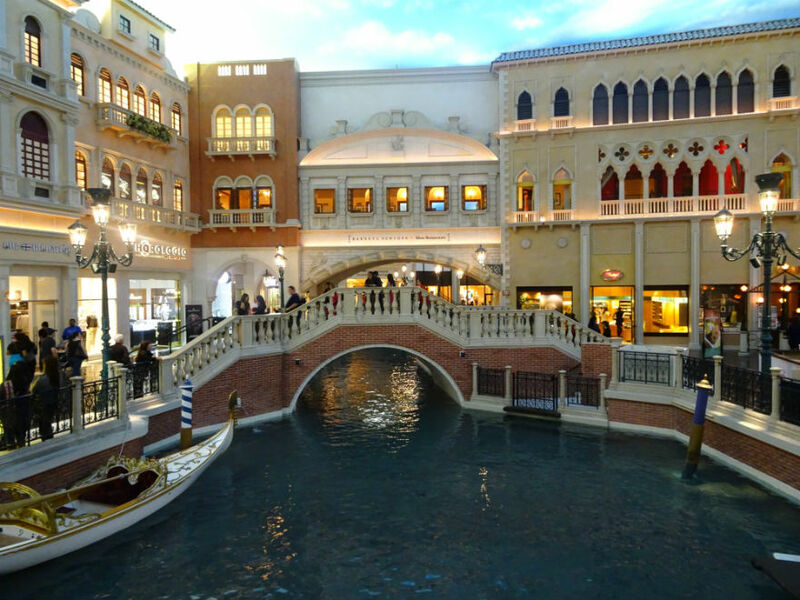 My top tips would be the Venetian hotel for its canals and Italian-style piazzas, as well as the Luxor for its incredible Titanic exhibition. And the soulful House of Blues restaurant inside Mandalay Bay also serves some fantastic food to chow down on. Angie from Silverspoon London also sings the praises of The Encore and The Wynn resorts. There’s no shortage of sensational shops (say that after a drink) in Vegas. It’s not all just high-end designer stores, though. There are touristy shops, tea shops, sock shops, chocolate shops… Make sure to leave space in your suitcase, as you’ll be needing it on the way back! If you’re a little bored of Vegas and fancy something a little different, there are a ridiculous number of day trips you can take. Of course, the most famous of them all is the Grand Canyon, but don’t forget others like Death Valley or the Valley of Fire. Or, if you’re feeling really fancy, take a helicopter tour just about anywhere! 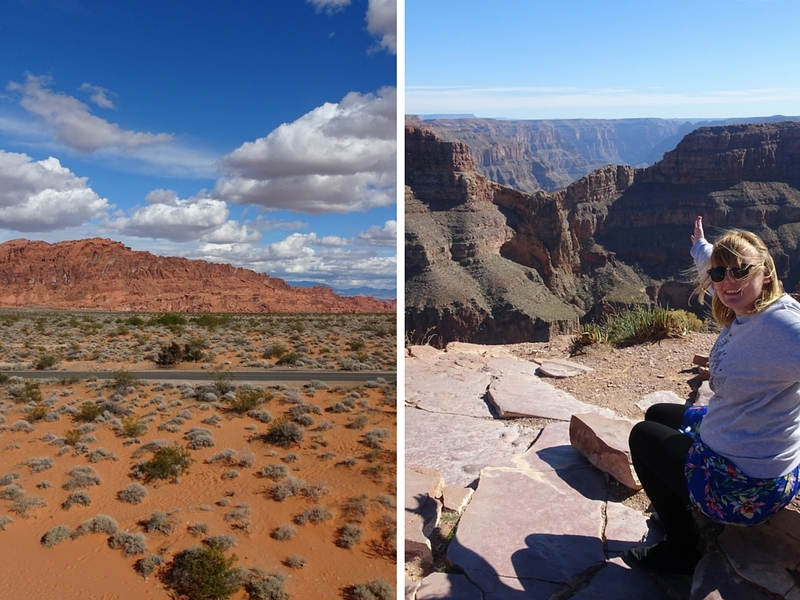 See 11 more day trips I recommend taking from Las Vegas here. If, like me, nightclubbin’ ain’t your thang (never let me say those words again) then a show is where you should be heading! There are so many different shows, from Cirque de Soleil to Celine Dion or Chippendales. Personally, I couldn’t go to Vegas and NOT see the Queen of Pop, Britney Spears! The venue was smaller than I was expecting which meant that wherever you sit you get an incredible view. And she was phenomenal live! 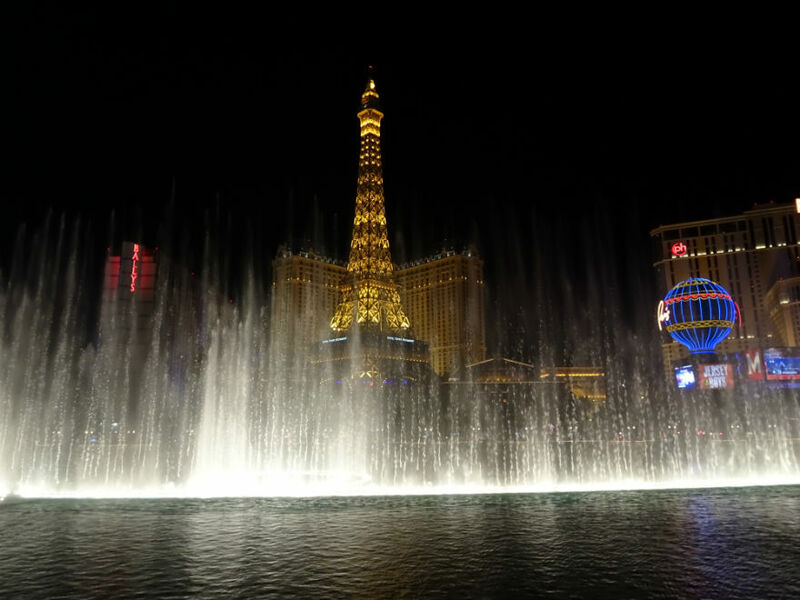 Romantic, a visual spectacle, a man-made marvel: however you want to refer to the Bellagio Fountains, you can’t take a trip to Sin City and not see them in person! There’s really no excuse for not seeing them, especially when they run seven days a week at 15-minute intervals. My best advice is to see them at night, with a backdrop of all the Vegas hotels. Thanks for mentioning me hon! I haven’t visited the neon museum yet but it does look very cool! Oooooooh I want to visit the Neon Museum! So jealous you saw Britney! Will definitely be using this list for my trip this summer. Thanks! Lovely post! I think the one part of Las Vegas people seem to forget about s how beautiful the surrounding desserts are and etc.